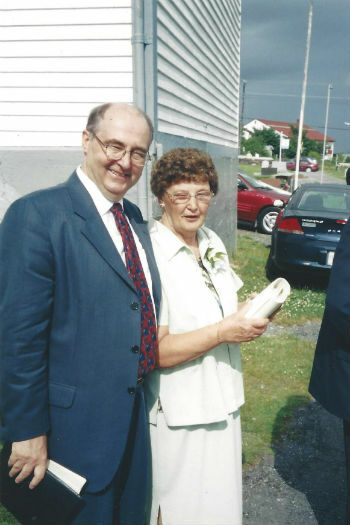 Neil with his parents at a 2004 family wedding. Mom's kindly intelligence shines through. It’s always a privilege to speak in a church 3 years older than the nation of Canada. “In my Father’s house there are many mansions.” There is a very broad consensus among our Christian denominations about what this refers to. The great Christian writer C.S. Lewis began life as an atheist teaching English literature. What surprised him was how all the overtly Christian authors he studied – whether Anglican, Catholic or Puritan – “all had the same smell about them,” his phrase. Today we have to ponder that because Jesus Christ lives inside the Christian, we believe that Death is not and cannot be the End. In fact, there is every indication that the Faithful Departed are in a privileged position. They are no longer in relationship with Jesus while beset by fears and cares and troubles – the Christian struggle – (as good as this is), but have been ushered into His very divine Presence. The veil has fallen away at last for Jesus has passed through it and taken us with Him, we read in Hebrews 10. So we are here today in what we rightly call GOD’s HOUSE to pay a fitting reflection on the loving and faithful service of my mother, Frances Earle. Over there is the organ where she spent some of her happiest days – as a dutiful organist, choir member, and trainer of musicians. Unless a whole battalion of Christian teachers and thinkers are all together wrong – from Thomas Aquinas to Billy Graham – and I don’t think they are – Mom’s death marks a profound advance in her Christian journey – from leading worship here on earth to ongoing worship in God’s House in the heavenly realms. The Book of Revelation is full of references to this. She has joined what Hebrews 12:24 calls the Assembly of the Firstborn, whose names are written in heaven. Funerals are not pleasant but they can be STRONG REAFFIRMATIONS of what we all believe. We believe that her body will be reunited with her spirit at the Resurrection of the Just. But we believe that she has already entered into what John Calvin called “the beginning of her rest” as one of the Just made perfect (Rev. 14:13, 6:9-11, and Anglican Prayer Book, page 599). So, mom has passed from a physical house of worship here below to the “house made without hands in the heavens” (2 Cor. 5). In that light, then, we should not grieve as people who live as unbelievers but as BELIEVERS reaffirming our own faith in the Resurrection as our Lord has shown us. At 2AM this Thursday morning, then, Mom passed over to the Beginning of her Eternal Reward.